Canaccord Genuity is hosting a special invite-only conference for corporate and entrepreneurial thought leaders in Waterloo. (If you are a senior executive working in the tech industry and you're looking for an invite or chance to speak, feel free to request one from Vishaal at events@thetechsociety.org). 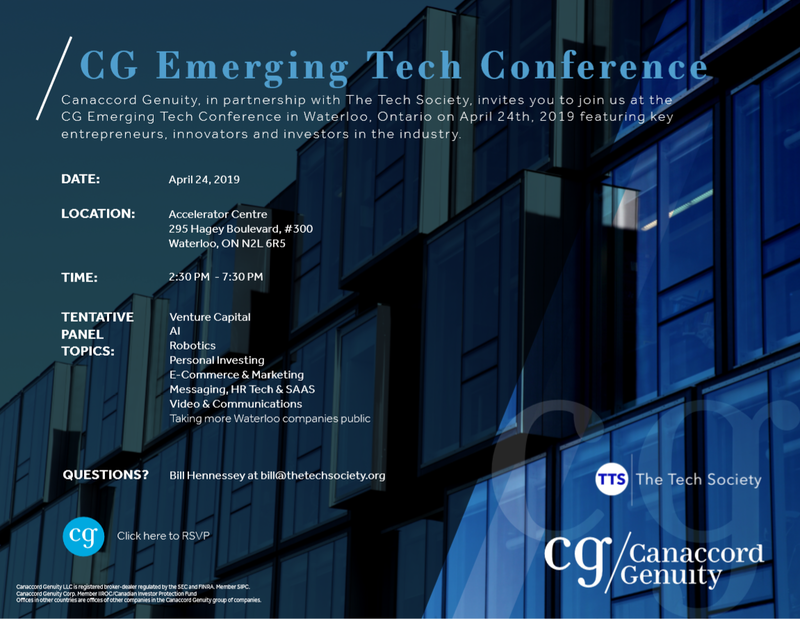 Canacord Genuity, in partnership with The Tech Society, invites you to join us at CG Emerging Tech Invite-only Conference @ Miller Thomson in The Accelerator Center in Waterloo on April 24th, 2019. This conference will take place from 2:30 pm - 7:30 pm and will include emerging tech panel and keynotes from 2:30 pm - 7:30 pm focused on taking Waterloo tech companies to the next level. Through its principal subsidiaries, Canaccord Genuity Group Inc. (the Company) is a leading independent, full-service financial services firm, with operations in two principal segments of the securities industry: wealth management and capital markets. Mallorie Brodie is the CEO and Co-founder of Bridgit, an easy-to-use mobile app built from the ground up to make construction projects less complicated from day one. Mallorie holds an Honours degree in Business Administration from the Richard Ivey School of Business. She has almost ten years of entrepreneurial experience. Mallorie holds various entrepreneurial awards, including receiving the top prize at Google Demo Day, being named Techvibes Entrepreneur of the Year, and being named to the Forbes Manufacturing & Industry 30 Under 30 class. Yvan Couture currently serves as the President and CEO of Primal AI, a company solving unstructured data environment problems for customers. Primal is a global AI leader with over 145 international patents. He is also an investor and the Chairman of the Board of The Official Community Corporation, a Toronto-based company working with recognized music artists all over the world. Yvan launched his technology industry career as the Vice-President of Finance and Administration at Focus Automation. In 1991, he created Taaz, a consulting firm serving emerging technology companies for nine years. He co-founded the Atlas Group and Communitech (both invaluable in shaping Waterloo Region’s technology industry). He served as Executive Vice-President of Mitra, a global healthcare informatics leader he helped start. He managed the growth to over 400 employees in four countries before leading negotiations for its sale in 2002 to Agfa.Yvan has won several awards over the years, including being selected as the Laurier MBA Alumnus of the Year in 2009. In 2011, out of over 80,000 graduates in the institution's history, Yvan was selected as one of Laurier's 100 Alumni of Achievement. Todd Bissett is a partner at Miller Thomson, and a leader in the areas of emerging growth and venture capital. Todd Bissett is a widely experienced business, technology, and international transactions lawyer, licensed in California and Ontario. He previously practiced for several years in Silicon Valley and Greater China. Todd’s emerging growth practice focuses on the complete life-cycle of startup companies, from formation and organizational work through equity and debt financings, mergers and acquisitions, and complex business combinations. Todd acts for both issuers and investors in investments, and sellers and buyers in M&A transactions. He has worked extensively with major institutional and strategic investors, venture capital and hedge funds, and companies and issuers from early stage startups to multinational public and private organizations. Todd has experience across several industries including software, telecommunications and value-added services, manufacturing, gaming, financial services, education, biotech, and medical products and services. Chris Schaefer is a Sr. Vice President, Branch Manager and Investment Advisor. Chris enjoys helping high net worth families and small business owners develop strategies for growing, preserving and transferring their wealth. With over 25 years in the financial services industry and a formal education in Business Finance, Chris believes successful wealth management is based on the ability to truly know and understand each of his clients’ needs and their overall financial picture. While Chris has learned to appreciate the value of a strong work ethic, trust and honesty are the core values that have guided him throughout his career. Working with a select clientele allows Chris to devote significant time and resources in providing individualized services and solutions.